The schedule for the Democratic National Convention has been released, and Bernie Sanders has been given a marquee speaking slot. The Vermont senator will address Democrats on opening night, along with Michelle Obama and immigration activist Astrid Silva. Sanders’ top speaking slot at the DNC is the biggest sign yet that the Democratic Party, after a protracted and sometimes vicious primary, is as close to unified as it’s been this entire cycle. Sanders endorsed Clinton earlier in the week, so it may not seem surprising that he’ll be speaking at the convention. But for the better part of the last six months, it was by no means a given that the two Democratic opponents would be able to reconcile their differences before the convention. For the first few months of the Democratic primary, the two candidates were quite civil and measured in their criticisms of one another. Sanders was praised early on for essentially giving Clinton a pass on the email controversy, and Clinton was generally uncritical of Sanders and his policy proposals. But as the campaign progressed, the two gradually ramped up their attacks on one another. Clinton accused Sanders of waging an “artful smear” against her with regard to her Wall Street speeches, and in April, Sanders claimed that Clinton was not “qualified” to serve as president. He quickly retracted the remark, but it was a stark illustration of how much animosity had grown between the two. Even when it became clear that Sanders wasn’t going to win the race, he was mum on whether he’d ever endorse Clinton. As recently as two months ago, he was declaring that Democrats would be having “a contested convention” in July. It appeared highly unlikely at that point that Sanders would give Clinton his blessing, and even more unlikely that he’d be offered a speaking slot at the convention. And yet Sanders eventually came around. He endorsed Clinton on Tuesday, and while this angered some of his supporters, polling suggests that Sanders voters more or less rallying behind Clinton. Crucially, Sanders succeeded in pushing the party’s official platform to the left, winning key concessions from centrist Democrats on financial regulation, the minimum wage, the death penalty, and more. He subsequently praised it as “the most progressive platform in party history" — and Clinton happily agreed. Now, Sanders will be speaking at the national convention, along with President Obama, Vice President Joe Biden, Bill Clinton and, of course, the presumptive nominee herself. That’s a pretty impressive turnaround from just two months ago, and it’s even more impressive when contrasted with the Republican convention, which is underfunded by several million dollars and, if the public statements of prominent Republicans are any indicator, may well be under-attended, too. To be sure, not all of Sanders’ supporters will pull the lever for Clinton, but for the many Democrats who spent the last year worrying that the party wouldn’t unified by November, this is about as close to a best-case scenario as they could have hoped for. 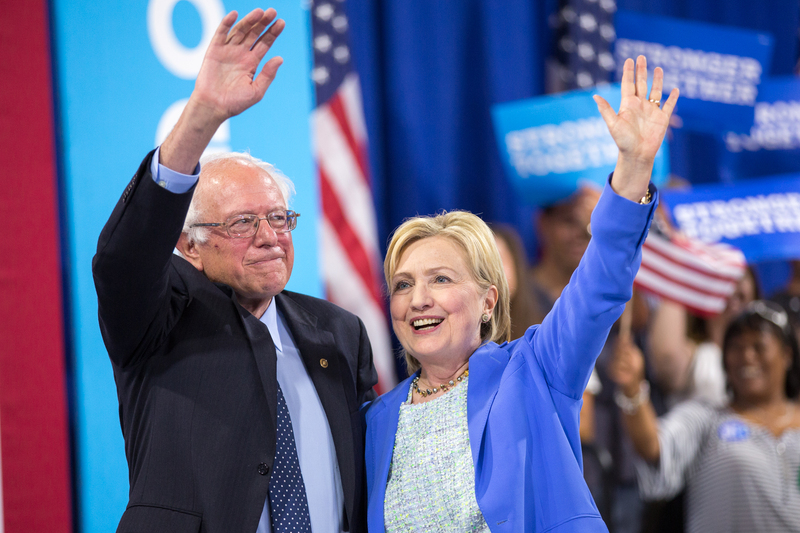 Sanders gets a progressive policy platform, and Clinton gets Sanders’ support. Everybody wins.